Most Michigan farmers markets are now open for the season. Have you visited one yet? Next time you’re out shopping for fresh, local produce, try finding these 5 superfoods! 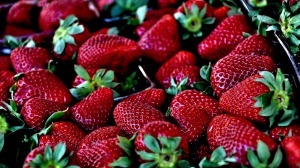 1) Strawberries – Rich in antioxidants, vitamins, and low in calories, fresh strawberries are truly a “sweet” snack. They usually become available in mid-May and have a short season, so get them while you can! *Note: Strawberries are on the “dirty dozen” list. Always choose organic. 2) Mushrooms – April and May showers bring forth an abundance of mushrooms in Michigan. Look for tasty spring morels or organically cultivated mushrooms. 3) Swiss Chard – Look for regular or rainbow swiss chard at the market. Leaves are dark green and loaded with nutrients. Swiss chard is quick and easy to prepare. See recipe below! 4) Parsley – Used in a huge variety of dishes, parsley is a fresh way to boost flavor and an excellent source of key nutrients. Depending on where you shop, parsley is the least expensive source of concentrated nutrients. 5) Beet Greens – Beet roots do not come into season until July, but if you’re lucky, you may find a farmer who has thinned their crop and has tender beet greens for sale. The taste and texture of the greens is similar to swiss chard. They are loaded with nutrients and can be used in place of chard in the recipe below. Click Here to find a local farmers market. Related: Growing your own food this spring? Check out our Top 5 Garden Vegetables!